Need a Last Minute Valentine’s Day Gift? Check out these Beautiful FREE Valentine’s Day Cards! Hey lovelies, we are rapidly approaching the most romantic day of the year! Have you got your sweetheart a gift yet? Have you had a hard time trying to find something in your budget? Well, I have the perfect ROMANTIC solution for anyone, no matter what your budget this holiday! Because, well, it’s FREE! But Even though it won’t cost you anything, it certainly doesn’t lack on romance! The Makers of my favorite calendar I use daily to keep myself beautifully organized (and I do mean BEAUTIFULLY organized) The Beautiful Calendar, has got you covered this Valentine’s Day! You’ve got to see these Amazing Calendars you can choose custom graphics for to make it your very own! But besides that, they have some really fabulous downloadable/printable Valentine’s Day Cards you can use for your loved one this Sunday! Beautiful Calendar’s Valentines Day Cards are unique, and like their calendars, truly beautiful too! They offer a selection of different romantic and meaningful cards to choose from for either straight, gay, or lesbian couples! I personally love the pretty graphics you will find on each card especially the cats, but you know, maybe that’s just me! I’m a total cat and Animal person, so I of course, love the use of animals and nature in these gorgeous Valentine’s Day Cards. These cards couldn’t be simpler to use! Just click the card here you would like to send to your Valentine, and it will take you to a page where you can choose to print or download the card and make it your very own. You can share it with your loved one via Google Drive by using the sharing link at the top of the card, or save it to your computer and send them a link to it via Twitter, Facebook, or his or her email. If you’re going for the old school look, print it off, sign it and stick it in an envelope for your loved one. What are you waiting for? Get your romantic Valentine’s Day Card from Beautiful Calandar today – Absolutely FREE! Also, be sure to check out my review on the BeautifulCalandar HERE, and stay organized in style! They also have some fabulous new doodle graphics you can update your custom BeatifulCalandar with! I personally love how beautiful and inspiring this Calendar truly is and I get a thrill out of visiting it each day on my desktop or mobile to not only see my plan for the day, but to start my morning off with something fabulous to look at! Who doesn’t love beauty first thing in the morning?! *This is a sponsored blog post by Beautiful Calandar. However, all thoughts and opinions expressed in this post are solely my own. I only share reviews with my readers, I feel will be beneficial or informative in some way. Unfortunately not all of us can have a personal stylist at hand, and sometimes, well we could use a little help with our style. There’s a reason us women always take our friends shopping, so we can get their opinion on items we take to the dressing room to try on, right?! Unfortunately as we get older, get married, have kids, etc, sometimes taking our best friend shopping with us isn’t always an option. Life gets in the way and often shopping with friends gets put to the side. Luckily there is an exciting fashion app you can use to get your “Best Friend’s Advice” on that outfit you’ve just tried on at Nordstrom! It’s super easy! 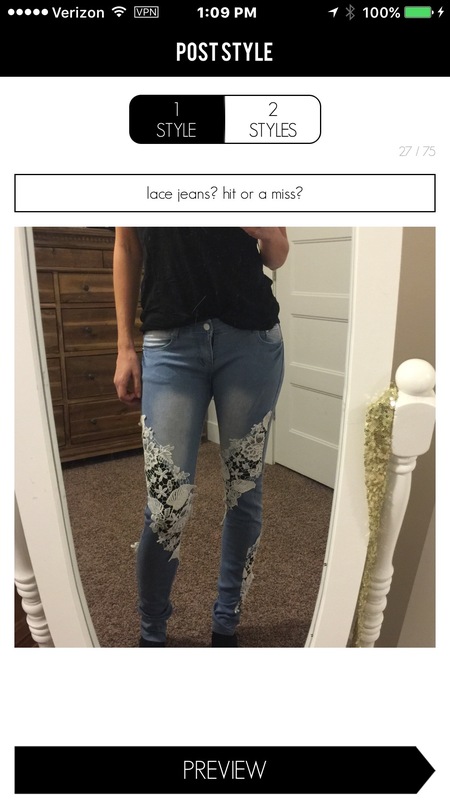 Just post the pic of the outfit to the Pick My Style App, and you’ll get instant feed back from other fashion-minded users! It’s like having your own personal stylist right in the dressing room with you! Maybe you’re the fashion expert and find enjoyment in helping others find their perfect style as well as helping newbies master putting fabulous looks together. 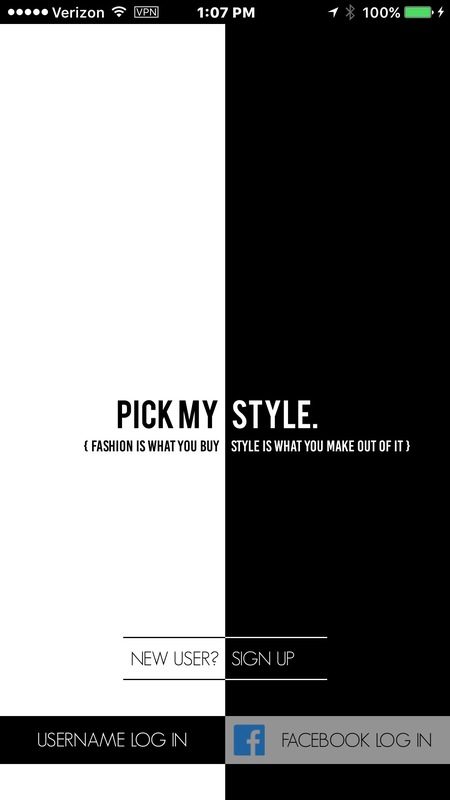 Pick My Style was designed to help users get AND give advice as well as help other users when it comes to choosing outfits and creating your own personal style. It’s a fabulous community of fashionistas who love sharing their style, helping others with their style, and asking the community for feedback on their style too! 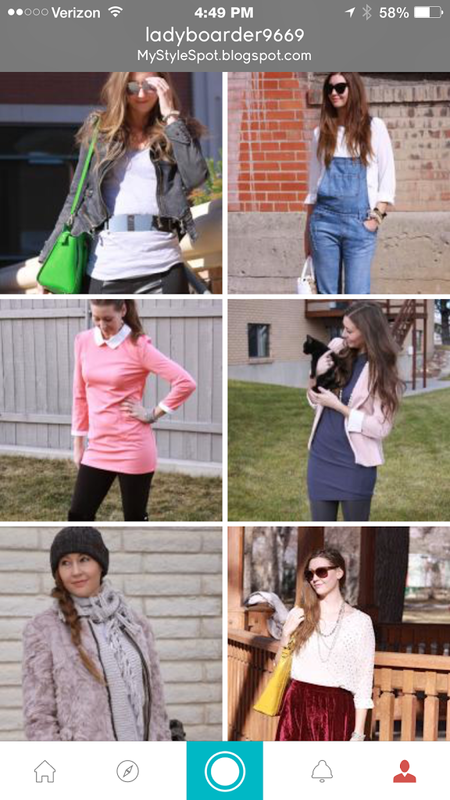 You can post several different posts when it comes to getting help with creating your look. You can create posts with questions such as “Which outfit looks best for my date tonight?” “Which shoe should I buy?” and then create a post showing the different looks, or styles, you have in mind for wearing or buying. You can also post fashion and style pictures for inspiration to other users or to keep in your own profile, as well as new trends you’re seeing. The handy bookmark feature on the site lets you save your favorite posts to refer back to later! You can add as many posts as you like and sit back and wait for the votes and advice to come rolling in. The app will let you know anytime you get some advice, so if you’re at the Limited, sitting in the dressing room waiting to hear back if that faux leather midi is a GO or a NO, the app will let you know as soon as you’ve gotten some feedback! When posting looks, Pick My Style also has a handy feature to make sharing the post across your social network a cinch too! Just in case you want to share that Gorgeous sequin party dress with your Facebook Friends, you just picked up for New Years Eve! 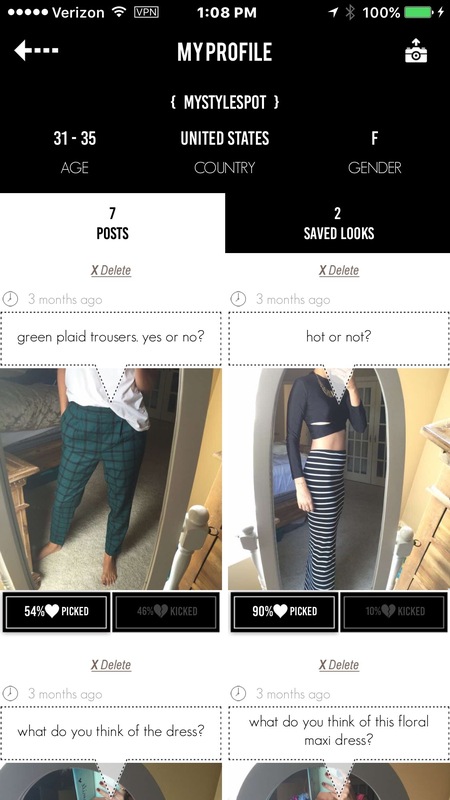 The part I find really addictive with this app, is voting on looks and helping others with their style questions. Just scroll through your feed and you can rate each style by selecting the “Pick This” or “Kick This” button, to give your feedback. I find myself scrolling through picture after picture when I have some extra time, voting on looks and putting my 2 cents in! It’s fun and HIGHLY addictive! You can also engage in the community with other users by commenting on posts as well. I love this because when I post a specific question about my style photo, I usually find a number of helpful comments from other users giving me some tips and more personalized advice I didn’t even think to include in my post question. It’s super easy to use, just download the app (available for IOS and Android) sign up, and start sharing pictures and rating style! Here’s where you can download the app today and start getting and giving fashion advice, inspiring style, and making new friends with other fabulous fashionistas! *This is a sponsored post by Pick My Style. However, all thoughts and opinions expressed in this post are solely my own. I only share reviews with my readers, I feel will be beneficial or informative in some way. In this day and age, there truly is an app for everything! In fact, thanks to a new FREE fabulous style app, called WeStyle, by the makers of FittingRoom, you can get fashion advice directly from other fashion lovers! I love some good fashion apps, but I’ve found this one by far to be the most addicting not to mention the most interactive. Wondering how it works? It’s super fun, you just build your own profile (takes seconds) then post your looks either for inspiration or fashion advice from other WeStyle App users. Posting couldn’t be easier either! Just choose a photo from your device, pick the format for your photo (you can choose different style boards if you have several different looks for the outfit, such as a close up on the bag, shoes, etc). Then just ask your question if you want advice, it just has to be in Yes or No format. If you don’t want advice on your look but simply want to share it with the community, you just simply select the “Inspire” star, and then post and that’s it! You also have the option to block out your face when posting looks if you would rather keep your privacy. I posted looks from my blog, but you can post anything you like, whether it be a selfie in the mirror or an outfit lying on your bed, you’re wondering wether looks good together or not. I’ve also seen other users post several different looks and ask the community which one they should wear, and to vote yes on that look. If you’re not into getting fashion advice or sharing your inspiring looks for other, you can browse the looks other users have posted and put in your 2 cents! At first I thought I would just post some looks and get some input and not worry so much about voting yes or no on other looks, but once I started scrolling through the looks and outfits, I found it quite addictive to vote and let other fellow We-Stylers know what I thought of their look. (And don’t worry when voting, your vote is kept private). You can also comment on looks which I found myself doing a bunch because I was absolutely impressed and stunned by a lot of looks I saw on the app! In fact, if you are a little hesitant about style and not sure what goes together, besides getting input from other users, this app and the other users looks are incredibly inspiring! I found a ton of fabulous looks I wanted to imitate! To give you an idea of what the app looks like, here is a picture of my profile page. As you can see you can upload a picture, so I used my blog profile picture. If you’re a fellow blogger, you have the option to add your blog so your fellow WeStyle users know where to find your fabulous site and hopefully you can get some more follows and hits to your blog this way too! Below my picture you can see I have posted 7 looks and have made 31 votes. You can also follow other users so their posts show up in your feed. Otherwise you can just scroll the “Discovery Section” of the app to see all recent style posts to the app. Here is a shot of my profile page showing the looks I have posted to WeStyle.